Earlier this year in July, I went to a conference in London as part of the AHRC funded research network project ‘China in Britain: Myths and Realities’. It was the third in the series on the theme of ‘Performance/Theatre/Music’ run by Dr. Anne Witchard from the University of Westminster. I’ve got to know her and the project well over recent months where I aim to present in the Spring of next year. The conference today was on the theme of ‘Aesthetics: Visual and Literary Cultures’…from fashion to architecture, literature, Chinoiserie, photography and writing. The first speaker of the day was Sarah Cheang from the Royal College of Art, London, who spoke of ‘Chinese Robes, on (and off) European Women’, including her new book ‘Sinophilia’ (which is a love of Chinese things, culture and people) and her research into modernity and Chinese fashion. She examined the notion of engagement with Chinese things in Britain in the early 20th Century, the use of garments by women, the highly desirable items in China, the significance of certain items within Western art, design, literature and theatre coming from perspectives of domestic, popular cultures and avant-garde. She referenced material interactions from the Pekingese dog to embroidery in Chinese clothing and accessories, and how these helped to underpin modernism and Orientalism. She goes on to examine this as a problematic, where we have this idea that fashion is popular and art is high, oppositions that are apart that try to come together where there are clear unresolved tensions in academic analysis, popular and fashionable, domestic and the feminine. She spoke of the concept of non-Western culture fueling cultural production in the West…fashionable displays of Chineseness, stylistic of modernity…the challenged cultural aesthetics in the West, the Orientalist construction of otherness, the reinforcement of Western identities, whilst exploring the representation of women in Chinoiserie fashion, the British female bodies and Chinese male bodies, and how Chinese fashion provides an alternative vocabulary for modern femininity, using their body as a site for the display of modernity. Speaker three was on ‘Constructing the Narrow Bridge of At: Katherine Mansfield, Ling Shuhua and Virgina Woolfe’ by Patricia Laurence of the City Universiy of New York. She opens with an image of the popular blue glazed plate that has a pictorial, realist representation of China, versus an illustrative re-appropriation of the said plate on the front on The New Yorker from 1942…’a world without optics or perspectives, the old China’…examining representation and historical reconstruction whilst referencing the Chinoiserie and its disruption in popular culture and consumerism, increasing aesthetic engagement with China. 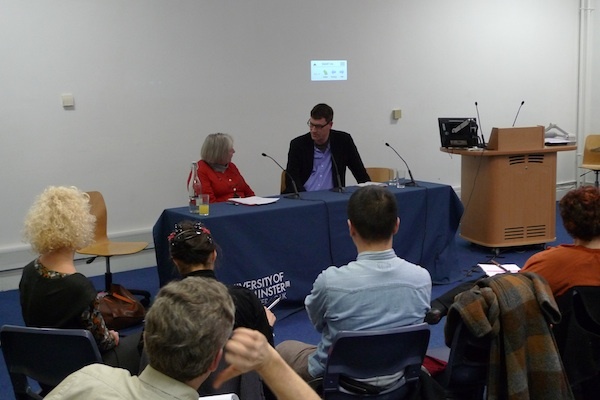 She discussed the creation of a transnational literary conversation between Mansfield, Ling and Woolfe. ‘When these authors are removed for their positions they present a more experimental form of literary criticism.’ The transnational bridge was constructed culturally, aesthetically and geographically beginning within the rebellion against Christian missionaries and the foreign presence in China. In the Q&A session, it was asked to Edward Denison as to Shanghai’s relationship to art deco. He saw it as a result of a certain ignorance in architectural history and that it shouldn’t be called art deco in modernist terms. The different strains of modernity means that it is from different areas of the world, yet unique to China…”hyper multiplicity” as such…of course it was in part art deco from the Chinoiserie, but it cannot be said that it was explicitly art deco at one time, it had many external influences. Architecture in China is referencing a vernacular Chinese style…it that Chinoiserie? An imitation of China’s own Chineseness? Edward stated that China has the longest continuous tradition of building in the world and that China is still trying to catch up with making sense of this architectural history. He also referenced the Pritzker Architecture Prize 2012, Wang Shu, the first Chinese winner, another turning point in China’s architectural history. Also questioned was the translation of literary and poetry works now taking place in China…seen as “Kissing the bride through the veil” as such. Discussion into the translation of texts from Chinese to English and vice versa, the quality of translation and its new prevalence as an industry in China and the West. The final session before lunch was ‘The Chinese Style in a Neoclassical Age’ by David Porter from the University of Michigan. The cultural landscape of the Neoclassical Age is recognizably like our own contemporary own. There is a clear foreign presence in the 18th Century from Chinese tea, the cornucopia of Chinese inspired objects presented within visual imagery (paintings), landscaped gardens and beyond…it was largely shaped by foreign imports, the world of Chinoiserie. David firstly defined ‘What is Chinoserie?’…a hybrid visual style, a family of styles, developing alongside other decorative trends, between Chinese and European visual vocabularies….from interior decoration to exterior architecture. David questioned how can we account for its popularity in 18th Century England? Novelty of Chinese style is not enough to explain its appeal…the type of novelty and norms it violated were part of its success. The iconography of Chinese images…a fascination or “intellectual sinophilia provoked a “nativist” reaction in England, changed norms and increased chauvinism. His third question was what cultural work was performed by Chinoiserie in 18th Century England…or what influence or impact did it have on subsequent developments there? Through hybridity, accommodation, interaction…these served as a prompt or catalyst within the host society. It is not measured by direct influence but by its reactivity…new modes of seeing, and meaning making within an English context. After the standard sandwich and fruit lunch, it was time for the afternoon session to begin with photographer Grace Lau’s ‘From Picturing the Chinese to 21st Century (British) Types’. She spoke of the history of photography’s first engagement with China, photographs and their initial export to the West, and her avid collector of Chinese postcards depicting historic China, Chinoiserie and its image, a deliberate symbol of exotic types for the overseas market. These postcards have been used in her practice as a theatrical tableau and physical backdrop specifically in ’21st Century Types’ (as shown below) where you can see she is directly influenced by the content and contexts of the collected postcards. Passers by in the seaside town of Hastings, UK, were invited into a constructed studio to be photographed, recorded, documented. Personal items were encouraged as she saw them as 21st Century props and representations of the current era. All the photographs were taken in the Summer 2005. She claims that no one ever asked her what she was doing the project for and had no want to look at the Chinese postcards that were provided for reference…they did not understand the irony or historical aesthetic…they assumed it was a seaside booth as they were given a digital copy to take away with them. They would occasionally ask questions about the objects in the room such as the absurd panda rug. This project for Grace was a reflex, a response. Another Q&A time between Grace and David focussing on the idea of Chinoiserie as a backdrop to culture, and the development of architectural writing, a reversal of transcultural knowledge…they forget China for a reason to avoid the challenge of a rising cultural supremacy. David was then asked how can we think of Chinoiserie in other European contexts not just England? And also in relation to other kinds of influences from other parts of the world such as North African and Indian…how do they work together rather than the purely English context you present to us? The reason David focused on England was because it went over a more diverse social strata, and more popular depictions and critiques, and a variety of cultural forms in comparison to other regions…this broadening in the notions of transcultural hybridisation in the aesthetic sphere is the most important factor by far…ultimately, what are these different types of cultural imports used for? The panel members were then asked about knowing what you are doing and the presentation of self in the papers presented…birth of a politicised awareness in the self and taste…gothic as a reaction to Chinoiserie, did they know or not know what they were doing, did this matter? David stated that there is an awareness that there the project of cultural nationalism is not as developed as it needs to be. It really is about a certain kind of anxiety complex. An audience member stated her personal interest in familiarisation to estrangement in the Chinoiserie…referencing the photography of Grace Lau and how people where not questioning the backdrop and set that they stood within. Is it so familiar now that we no longer notice its origins in China or India or Japan? Have we now lost the origins of these aesthetics? What is this leading us towards? David referenced this as an issue of dealing with a culture collage. The penultimate session on the day was an in conversation with Paul French, author of many books including ‘Midnight in Peking’ (2012) who lives in Shanghai, and Frances Wood from the British Library. I think I’ve seen him speak before with the Royal Asiatic Society (RAS) once. He spoke of ‘The Lure of China – Writing China Then…’, the narrative of Shanghai and how it is quite a lot shorter than Beijing and how he is interested in the driftwood, the foreigners who went out to China and didn’t want to be found, the misguided patriots, a whole other group of people that he sees as the underbelly, the colony of foreigners, in Beijing and Shanghai. He asks what history foreigners don’t know about China versus what the Chinese don’t know about China and that a part of this history will always be lost to us. He asks the question as to what people should read about China now…not as in contemporary texts…they suggested 18th Century texts, and more recent fiction including ‘Man’s Fate’ (1990) by Andre Malraux, ‘China to Me’ (1999) by Emily Hahn, ‘Midnight’ (2001) by Mao Tun and ‘Fortress Besieged’ (2006) by Qian Zhongshu and Jonathan Spence. The final speaker of the day was Chinese novelist and filmmaker Xiaolu Guo in conversation with Professor Harriet Evans from the University of Westminster. Xiaolu stated…my existence is very bohemian, I am anti-academic and establishment, of the big organisations, with a want to find a different way of publishing online or through film. I want to refuse the covers of my books as I don’t see myself in a certain gender…that’s my frustration with the marketing and commercial side of things. I come from an intellectual background fueled by men. We are in a commercialised “salon”. It is a very political decision how you write in English and how you push the Chinese elements and message into these novels with the young female characters. It’s a very political subject with the publishers. How do I deliver this as a young woman? They deal with very detached, alienated and dislocated experience of migration and location. She was asked are you conscious you are writing about China and Chinese experiences or are you writing about the alienated experiences of life, of exile, of dislocation? She said you can’t help but write about a certain kind of China, and struggle with the sense of Chinese identity…I often ask people what is Chinese? Minority? Majority? A state concept? British society has a lot more knowledge of Indian culture or other cultures…the depth of trying to understanding another culture, or to understand China is disappointing. Xiaolu was asked whether the whole cliche of lost in translation does that resonate with you when you write in English? She states that’s obvious! I see romanticism as lost within me, but anger showing…I live very politically, as a politically intellectual person, I detest those who write for a consumption of the reader. This is a dignity the artist can hold, it is a value you build, and I value this…it is strength.